Are you tired of the same old holiday fare? "What do you eat on Christmas Day? "—this is probably one of the by frequently asked questions during Christmastime. While some people swear on the traditional roast with red cabbage and dumplings, others vary their choice of dishes between festive carp, opulent cheese fondue, and the down-to-earth potato salad with sausages. It is not unusual that after eating goose leg with kale for 3 days in a row or nibbling Christmas cookies all day every day, a strong desire to eat something non-holiday-related suddenly appears. If you are looking for alternative and light dishes for Christmas, we’ve got the right ones for you. These 6 recipes provide a fresh, yet elegant alternative to the traditional Christmas dishes. Who says that there has to be potato dumplings for Christmas Dinner? These dumplings with spinach, garlic, and nutmeg, provide a great twist on the traditional side. Thanks to the combination of crispy radicchio and fresh yogurt dressing, this dish turns out to be not too heavy. This aromatic beetroot salad with roasted pine nuts, creamy goat cheese, and fresh lemon vinaigrette is the perfect starter for your Christmas menu. In fact, it is also ideal as a light lunch or dinner, if there already is a heavy meal on your plan the same day. Cheese with a pastry crust—a simple dish you can never go wrong with! It's prepared in less than 30 minutes and just so incredibly delicious! The grape chutney provides a fruity and fresh note to this hearty recipe. 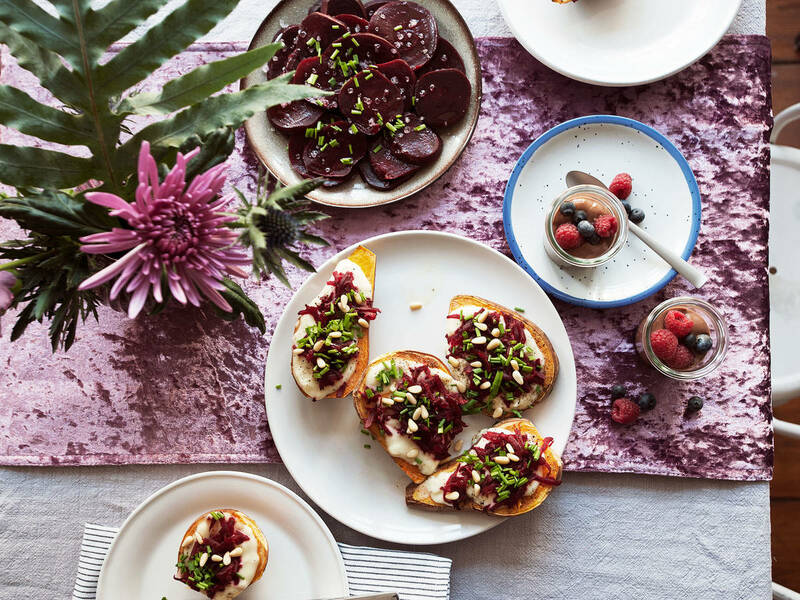 This one is not only a treat for the eyes—thanks to the sophisticated composition of baked sweet potato, a creamy topping, and juicy red beet—wow-factor is guaranteed. The truffle oil adds a noble touch to the topping and turns the dish into a small delicacy. So simple and yet so ingenious. The golden brown baked fish gratin with salmon, with cheese and an irresistible creamy sauce, will definitely score! If you like fish, you will love this gratin! In this calorie-intense time of the year, a healthy alternative to the usual chocolate dessert comes along just at the right moment! Thanks to avocado and banana, the pudding is creamy and aromatic. But that's not all: The chocolate pudding is ready to snack in 20 min. and can also be prepared as delicious ice cream—all you have to do is to freeze the pre-cut banana and then add it to a blender, together with the remaining ingredients. What's your favorite non-holiday recipe? Share it in the comments for all to enjoy!